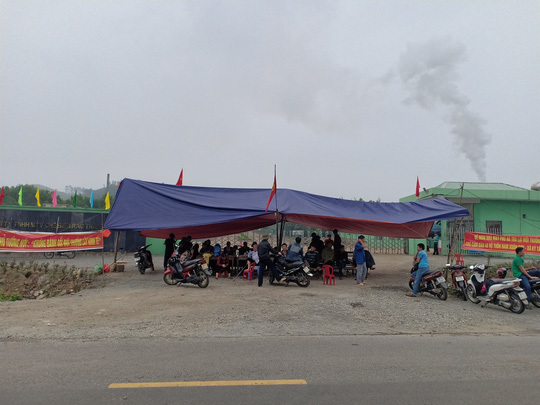 Local people in Ky Anh District, Ha Tinh Province have set up a protest camp outside the Phu Ha Waste Treatment Plant for a third time, complaining it has seriously polluted the environment. On February 11, dozens of households gathered in front of the plant with various banners. They also blocked the road and prevented rubbish trucks from going into the plant. 61-year-old Nguyen Tiet Phung said they had protested since February 7. "Only the local residents will understand our hardship. Flies are everywhere. We have to constantly wave the flies away while trying to eat. The foul smell is unbearable, especially during the Tet Holiday. Our wish is to be relocated somewhere else but there's still no plan. The authorities keep saying that the work is in the process," he said. Bui Quang Hoan, chairman of Ky Anh District, said he had been informed about the protest and started working with related parties. "From February 8 to 10, we basically dealt with the insects after spraying mosquito repellent around the plant. We are persuading the locals to spray their houses and will discuss the problem with them after the insects are completely dealt with," he said. He went on to say that the district authorities had approved the resettlement plan and just started ground clearance. However, they are facing some difficulties with administrative procedures. Hoan promised that they will work hard to complete the plan this year. Last year, the residents in Ky Anh protested over the pollution caused by Phu Ha Waste Treatment Plant in February and August. Ha Tinh People's Committee then allowed Ky Anh authorities to compensate and relocate the affected households to another area in Ky Tan Commune. However, the plan still hasn't started and the locals are still having to live with pollution.